Tottenham manager Andre Villas-Boas has warned goalkeeper Hugo Lloris not to expect an instant call-up if first-choice Brad Friedel has a bad game. 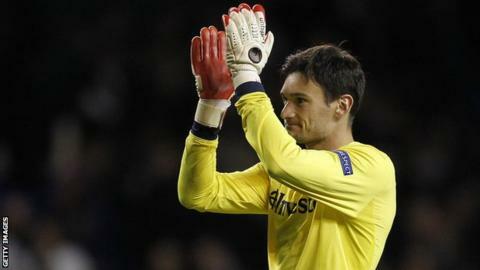 France captain Lloris was signed from Lyon for £8m with the expectation he would be the club's first choice. But the 25-year-old has played just once - in the Europa League draw with Lazio on Thursday. "We have made Hugo aware that whenever Brad has a bad game we won't drop him," Villas-Boas said. Friedel, 41, made a number of impressive saves in Tottenham's 2-1 win over QPR on Sunday and is likely to start at Manchester United next weekend. That will prolong Lloris' spell out of the team, a situation that has been met with incredulity in France. "These things have to be taken very carefully," Villas-Boas said. "We don't doubt Hugo's dimension and talent but at the moment we are paying respect to a player who is performing very well. "At the right time we will think about it and Hugo is an extremely good professional. "He wants to come back into the team but he is competing for the jersey and he will get his chance very soon."